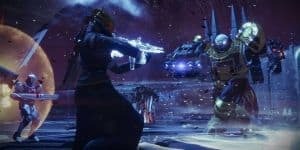 Destiny 2 Gets Biggest Launch Sale Of the Year | Nerd Much? Bungie is proud to announce that not only is Destiny 2 popular, it has the sales numbers to reflect that. Bungie is proud to announce that not only is Destiny 2 popular, it has the sales numbers to reflect that. When the game launched on consoles September 6, Destiny 2 managed to surpass the original Destiny’s records for engagement and digital sales for that launch week. The first Destiny had broken all video game sale records during its time, and Destiny 2 still managed to break those too. Destiny 2 hasn’t even been released on PC yet, so we’ll be waiting on those numbers to add to the record-breaking total. Furthermore, Destiny 2 hit 600 million minutes on Twitch before Leviathan launched, and shot up to the #1 positions on Twitch for total concurrent viewers after the raid was released. The numbers are certainly huge and it’s good to see so many gamers coming together over one game. As usual for the franchise, it is likely that these numbers will stay up there for quite some time – no For Honor disaster will be seen here. Destiny 2 will launch on October 24, 2017 on the PC. The game is out now on the PS4 and Xbox One for the current price of $59.99 USD. On the PS4 timed exclusive content will last until fall 2018 and currently includes multiplayer map, a three-player cooperative Strike, a blue and white colored ship, specialized gear sets, and an exotic weapon.